Home PowerShell Search SharePoint 2013 SharePoint 2016 How to Reindex a SharePoint Site using PowerShell? How to Reindex a SharePoint Site using PowerShell? 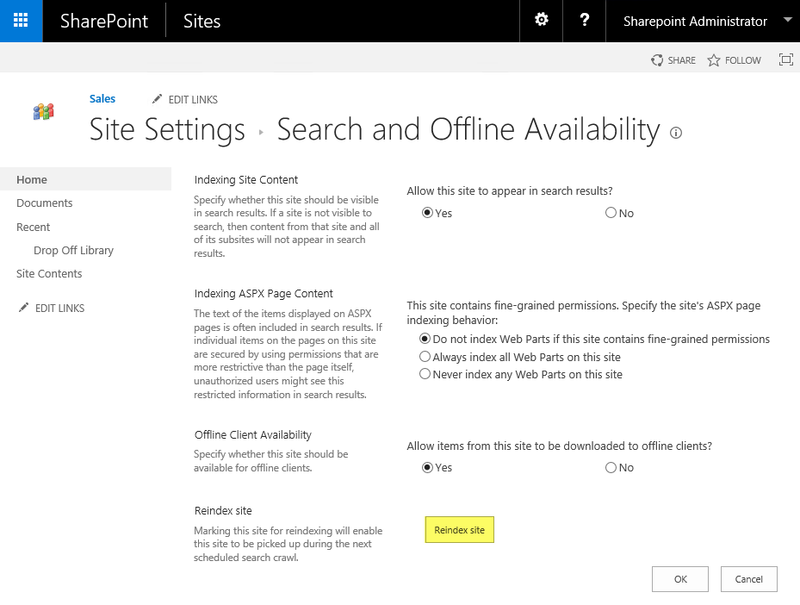 Requirement: Reindex SharePoint Site collection using PowerShell. Reindex feature introduced in SharePoint 2013 on wards allows you to force the search service to re-index the whole site, list or library (doesn't matters items are changed or not). By default, the full crawl picks up all items, however when you reindex, SharePoint marks the Items for re-crawl and they will be crawled during the next incremental or continuous crawl. How to Reindex a SharePoint Site? To reindex a site, Go to: Site Settings >> Click on "Search and Offline Availability" under search, Click on "Reindex site" button in reindex site section. Confirm the prompt to re-crawl. Here is the PowerShell for SharePoint to reindex site collection. Write-host -f Green "Search Version has been increased to $SearchVersion on $($_.URL)"
To reindex site in SharePoint Online using PowerShell, refer: SharePoint Online: How to Trigger Full Reindex using PowerShell?